^ 1.0 1.1 Glossary of NHC Terms. National Hurricane Center. 2013-03-25 [2015-03-27]. （原始内容存档于2014-06-01）. ^ 2.00 2.01 2.02 2.03 2.04 2.05 2.06 2.07 2.08 2.09 2.10 2.11 David A. Zelinski and Richard J. Pasch. Tropical Cyclone Report: Hurricane Marie (PDF). National Hurricane Center (Miami, Florida: National Oceanic and Atmospheric Administration). 2015-01-30 [2015-05-03]. （原始内容存档 (PDF)于2015-02-12）. ^ Mike Tichacek. Tropical Weather Discussion (TXT). Tropical Analysis Forecast Branch; National Hurricane Center (Miami, Florida: National Oceanic and Atmospheric Administration). 2014-08-10 [2015-05-03]. （原始内容存档于2014-09-07）. ^ Christopher W. Landsea. Subject: F1) What regions around the globe have tropical cyclones and who is responsible for forecasting there?. National Hurricane Center. National Oceanic and Atmospheric Administration. 2014 [2015-05-03]. （原始内容存档于2015-03-26）. ^ Eric S. Blake. Tropical Weather Outlook (TXT). National Hurricane Center (National Oceanic and Atmospheric Administration). 2014-08-10 [2015-05-03]. （原始内容存档于2014-09-07）. ^ Stacy R. Stewart. Tropical Weather Outlook (TXT). National Hurricane Center (National Oceanic and Atmospheric Administration). 2014-08-10 [2015-05-03]. （原始内容存档于2014-09-07）. ^ Christopher W. Landsea. Tropical Weather Discussion (TXT). Tropical Analysis Forecast Branch; National Hurricane Center (Miami, Florida: National Oceanic and Atmospheric Administration). 2014-08-10 [2015-05-03]. （原始内容存档于2014-09-07）. ^ Eric S. Blake. Tropical Weather Outlook (TXT). National Hurricane Center (National Oceanic and Atmospheric Administration). 2014-08-11 [2015-05-03]. （原始内容存档于2014-09-07）. ^ Christopher W. Landsea. Tropical Weather Discussion (TXT). Tropical Analysis Forecast Branch; National Hurricane Center (Miami, Florida: National Oceanic and Atmospheric Administration). 2014-08-11 [2015-05-03]. （原始内容存档于2014-09-07）. ^ Mike Tichacek. Tropical Weather Discussion (TXT). Tropical Analysis Forecast Branch; National Hurricane Center (Miami, Florida: National Oceanic and Atmospheric Administration). 2014-08-11 [2015-05-03]. （原始内容存档于2014-09-07）. ^ Marshall K. Huffman. Tropical Weather Discussion (TXT). Tropical Analysis Forecast Branch; National Hurricane Center (Miami, Florida: National Oceanic and Atmospheric Administration). 2014-08-16 [2015-05-03]. （原始内容存档于2014-09-07）. ^ Eric S. Blake. Tropical Weather Outlook (TXT). National Hurricane Center (Miami, Florida: National Oceanic and Atmospheric Administration). 2014-08-17 [2015-05-03]. （原始内容存档于2014-09-04）. ^ Stacy R. Stewart. Tropical Weather Outlook (TXT). National Hurricane Center (Miami, Florida: National Oceanic and Atmospheric Administration). 2014-08-18 [2015-05-03]. （原始内容存档于2014-09-04）. ^ Robbie J. Berg. Tropical Weather Outlook (TXT). National Hurricane Center (Miami, Florida: National Oceanic and Atmospheric Administration). 2014-08-18 [2015-05-03]. （原始内容存档于2014-09-04）. ^ Stacy R. Stewart. Tropical Weather Outlook (TXT). National Hurricane Center (Miami, Florida: National Oceanic and Atmospheric Administration). 2014-08-19 [2015-05-03]. （原始内容存档于2014-09-04）. ^ Stacy R. Stewart. Tropical Weather Outlook (TXT). National Hurricane Center (Miami, Florida: National Oceanic and Atmospheric Administration). 2014-08-20 [2015-05-03]. （原始内容存档于2014-09-04）. ^ 18.0 18.1 Stacy R. Stewart. Tropical Depression Thirteen-E Discussion Number 1. National Hurricane Center (Miami, Florida: National Oceanic and Atmospheric Administration). 2014-08-22 [2015-05-03]. （原始内容存档于2014-10-06）. ^ 19.0 19.1 National Hurricane Center; Hurricane Research Division; Central Pacific Hurricane Center. The Northeast and North Central Pacific hurricane database 1949–2013. United States National Oceanic and Atmospheric Administration's National Weather Service. 2014-07-07 [2015-05-03]. （原始内容存档于2014-09-12）. A guide on how to read the database is available here. ^ Robbie J. Berg. Tropical Storm Marie Discussion Number 2. National Hurricane Center (Miami, Florida: National Oceanic and Atmospheric Administration). 2014-08-22 [2015-05-03]. （原始内容存档于2014-09-04）. ^ Todd B. Kimberlain. Tropical Storm Marie Discussion Number 4. National Hurricane Center (Miami, Florida: National Oceanic and Atmospheric Administration). 2014-08-23 [2015-05-03]. （原始内容存档于2014-11-03）. ^ David P. Roberts. Hurricane Marie Discussion Number 6. National Hurricane Center (Miami, Florida: National Oceanic and Atmospheric Administration). 2014-08-23 [2015-05-03]. （原始内容存档于2014-10-06）. ^ Christopher W. Landsea. Hurricane Marie Discussion Number 8. National Hurricane Center (Miami, Florida: National Oceanic and Atmospheric Administration). 2014-08-23 [2015-05-03]. （原始内容存档于2014-11-03）. ^ John P. Cangialosi. Hurricane Marie Discussion Number 10. National Hurricane Center (Miami, Florida: National Oceanic and Atmospheric Administration). 2014-08-24 [2015-05-03]. （原始内容存档于2014-10-06）. ^ John P. Cangialosi and Todd B. Kimberlain. Tropical Cyclone Report: Hurricane Odile (PDF). National Hurricane Center (Miami, Florida: National Oceanic and Atmospheric Administration). 2014-12-19 [2015-05-03]. （原始内容存档 (PDF)于2014-12-22）. ^ Hurricane Research Division. Hurricane Marie Operational Best Track. National Hurricane Center. National Oceanic and Atmospheric Administration. 2014-08-29 [2015-05-03]. （原始内容存档于2015-05-03）. ^ Todd B. Kimberlain. Hurricane Marie Discussion Number 13. National Hurricane Center (Miami, Florida: National Oceanic and Atmospheric Administration). 2014-08-25 [2015-05-03]. （原始内容存档于2014-10-06）. ^ Todd B. Kimberlain. Hurricane Marie Discussion Number 17. National Hurricane Center (Miami, Florida: National Oceanic and Atmospheric Administration). 2014-08-26 [2015-05-03]. （原始内容存档于2014-10-06）. ^ John P. Cangialosi. Hurricane Marie Discussion Number 18. National Hurricane Center (Miami, Florida: National Oceanic and Atmospheric Administration). 2014-08-26 [2015-05-03]. （原始内容存档于2014-10-06）. ^ Daniel P. Brown. Tropical Storm Marie Discussion Number 24. National Hurricane Center (Miami, Florida: National Oceanic and Atmospheric Administration). 2014-08-27 [2015-05-03]. （原始内容存档于2014-10-06）. ^ Robbie J. Berg. Tropical Storm Marie Discussion Number 25. National Hurricane Center (Miami, Florida: National Oceanic and Atmospheric Administration). 2014-08-28 [2015-05-03]. （原始内容存档于2014-10-06）. ^ Scott Stripling. Tropical Weather Discussion (TXT). Tropical Analysis Forecast Branch; National Hurricane Center (Miami, Florida: National Oceanic and Atmospheric Administration). 2014-08-30 [2015-05-03]. （原始内容存档于2014-09-07）. ^ Activan alertas 6 estados por Marie; prevén que sea huracán. El Universal. 2014-08-22 [2015-05-03]. （原始内容存档于2014-08-26）. ^ 34.0 34.1 Huracán "Marie" deja 10.000 familias damnificadas y tres desaparecidos. Agencia EFE, S.A. El Heraldo. 2014-08-25 [2014-05-03]. （原始内容存档于2014-10-24）. ^ Marie causa daños en carreteras de Oaxaca. El Universal. 2014-08-22 [2015-05-03]. （原始内容存档于2014-08-28）. ^ Alerta en México por fuertes lluvias asociadas al paso del huracán Marie. ABC. 2014-08-25 [2015-05-03]. （原始内容存档于2015-05-03）. ^ NOTIMEX. Marejadas dañan nuevamente balnearios de Colima. El Universal. 2014-08-26 [2015-05-03]. （原始内容存档于2014-08-29）. ^ Antonio Vázquez López. Marie causa la muerte de dos personas en la Costalegre de Jalisco. Notisistema. 2014-08-25 [2015-05-03]. （原始内容存档于2014-10-23）. ^ Marie ya es huracán; no tocará tierra: SMN. El Universal. 2014-08-22 [2015-05-03]. （原始内容存档于2014-08-30）. ^ Guerrero descarta daños graves por huracán Marie. El Universal. 2014-08-25 [2015-05-03]. （原始内容存档于2014-10-23）. ^ Hurricane Marie Causes Damages in Colima, Mexico. teleSUR. 2014-08-24 [2015-05-03]. （原始内容存档于2015-02-13）. ^ Marie se aleja de Jalisco sin causar mayores daños. El Universal. 2014-08-25 [2015-05-03]. （原始内容存档于2014-08-27）. ^ Suspenden clases en Los Cabos por huracán Marie. Zócalo Saltillo. 2014-08-25 [2015-05-03]. （原始内容存档于2014-10-23）. ^ 44.0 44.1 Severe Weather Statement: High Surf Advisory. National Weather Service in Los Angeles, California (Iowa Environmental Mesonet National Weather Service). 2014-08-24. ^ Severe Weather Statement: High Surf Advisory. National Weather Service in San Diego, California (Iowa Environmental Mesonet National Weather Service). 2014-08-25. ^ 46.0 46.1 Sandy Mazza. Catalina Island digging out from Hurricane Marie winds, swells. Daily Breeze. 2014-08-28 [2015-05-03]. （原始内容存档于2014-10-23）. ^ 47.0 47.1 47.2 Hurricane Marie's Wave Action Floods Seal Beach, California. Associated Press. The Weather Channel. 2014-08-28 [2015-05-03]. （原始内容存档于2015-04-25）. ^ Seal Beach works with County of Orange to replace sand lost to Hurricane Marie. Orange County Breeze. 2014-09-04 [2015-05-03]. （原始内容存档于2014-10-23）. ^ Emily Sawicki. Surfer Dies After Drowning Near Malibu Pier. Malibu Times. 2014-08-26 [2015-05-03]. （原始内容存档于2014-08-31）. ^ Samia Khan. High Surf Advisory Continues After Waves Destroy Lifeguard Building, Damage Malibu Pier. NBC Los Angeles. 2014-08-28 [2015-05-03]. （原始内容存档于2014-10-12）. ^ 51.0 51.1 Catalina Island suffers significant damage from Hurricane Marie waves. Los Angeles Times. 2014-08-28 [2015-05-03]. （原始内容存档于2015-03-28）. ^ High surf: Seal Beach floods, Malibu Pier closed, 100+ rescued (updated). 89.3 KPCC. 2014-08-27 [2015-05-03]. （原始内容存档于2014-10-11）. ^ Andrew Lopez. Large Crowds Expected Again as High Surf Pounds Orange County Beaches. NBC Los Angeles. 2014-08-28 [2015-05-03]. （原始内容存档于2014-10-24）. ^ 54.0 54.1 Karen Robes Meeks. Army Corps of Engineers examines Hurricane Marie surge damage to Long Beach breakwater. Long Beach Press Telegram. Long Beach, California. 2014-09-04 [2015-05-03]. （原始内容存档于2014-10-23）. ^ 55.0 55.1 55.2 Jonathan Van Dyke. 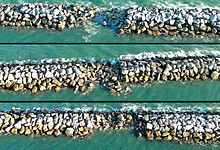 Update: First Breakwater Fixes Estimated To Cost $20 Million. The Grunion Gazettes. 2014-09-10 [2015-05-03]. （原始内容存档于2014-09-14）. ^ Jonathan Van Dyke. Army Corps Works To Solve Breakwater Breaches After Storm Surge. The Grunion Gazettes. 2014-09-05 [2015-05-03]. （原始内容存档于2014-09-07）. ^ Veronica Rocha. Hurricane swells cause $20 million in damage to port breakwater. Los Angeles Times. 2014-09-10 [2015-05-03]. （原始内容存档于2015-03-22）. ^ Karen Robes Meeks. Port of Long Beach may spend $3.8M more to fix Hurricane Marie damage. Long Beach Press Telegram. Long Beach, California. 2015-01-10 [2015-05-03]. （原始内容存档于2015-02-12）. ^ 59.0 59.1 Karen Robes Meeks. Port of Long Beach leaders approve $3.8 million to fix Hurricane Marie-damaged port areas. Long Beach Press Telegram. Long Beach, California. 2015-01-12 [2015-05-03]. （原始内容存档于2015-02-12）. ^ 60.0 60.1 Greg Yee. Wednesday’s high surf brings flooding, ocean rescues, traffic. Long Beach Press Telegram. 2014-08-28 [2015-05-03]. （原始内容存档于2015-02-12）. ^ Hetty Chang; Jane Yamamoto. Residents Brace for Hurricane Norbert. NBC Los Angeles. 2014-09-06 [2015-05-03]. （原始内容存档于2014-10-23）. ^ Greg Fuderer. Port breakwater repairs underway. Long Beach, California: United States Army Corps of Engineers. 2014-11-03 [2015-05-03]. （原始内容存档于2015-02-12）. ^ Robert J. Lopez. Big surf pounds Catalina, causes major damage to boatyard, harbor. Los Angeles Times. 2014-08-27 [2015-05-03]. （原始内容存档于2015-03-13）. ^ Hetty Chang and Kelly Goff. Catalina Residents Clean Up After the Storm. NBC Los Angeles. 2014-08-28 [2015-05-03]. （原始内容存档于2014-10-23）. ^ Max Mayfield. Preliminary Report: Hurricane Linda. National Hurricane Center (Miami, Florida: National Oceanic and Atmospheric Administration). 1997-10-25 [2015-05-03]. （原始内容存档于2014-11-02）.